Question: What is the meaning of a “positive mood” in a Kabbalistic group? Answer: In a Kabbalistic group a person’s mood is under the influence of the surrounding environment and only that. This is because one who advances, correcting himself, is practically never in control of himself. He exists either in an uplifted state, when the Light pulls him upward, or in a descent into the worst possible dark state, when the upper Light releases him. That is why he is constantly in states that he cannot regulate nor create something above himself. We are not talking about an ordinary person in our world who exists under the influence of two opposing forces that constantly, like on a swing, toss him up or throw him down. That is why he needs to be connected to a society that buffers his states, transferring them to itself and passing them back to him. In other words, while in an ascent, the individual passes to the group his confidence, knowledge, understanding, and desire to progress; and when he is in a descent, the group returns this all back to him. Then again, in a positive state, he passes all of that to the group, and in a negative state, the group elevates him. It turns out that if he passes these states through the group, then there is always a closed ever-changing contour, and he is constantly moving forward. But without a correct society that helps him advance with the help of a certain agreement called “mutual guarantee” (Arvut), he cannot progress. The upper force will constantly be throwing him into an opposite state. Question: What is meant by positive mood—to be happy, joyous? Answer: For a Kabbalist, it is the confidence that in each moment he is in a correct relationship with the Creator. The descents and ascents bring him out of this relationship. Moreover, while in ascents he feels that he is the master of himself and the entire world. Question: What kind of actions can an individual make in order to raise the mood of those around him? Answer: He must do the same for them as he expects from them. Question: How do we correctly elevate the mood of an individual who is engaged in inner work and not interfere with his focus? Answer: Only through example. Demonstrate to him, without words, that you are in the correct, positive, creative ascent. Help him only through your inner intention and desire, and externally, by an unobtrusive example. Question: How can I see that my friend is in a state of descent? Does he need to tell me about it? Answer: If he really cannot do anything, then he must speak about it to his friends and ask for them to take him into their hands. Moreover, the individual understands that by this, he helps others and the group. He can not only ask for help for himself, but also give the ability to the group to unite around him. In this case the group, undoubtedly, rises. The individual must understand that the friends work together as one soul. There is nothing shameful in this. But on the contrary, if he really has no strength, then it is a sign that he must turn to them because they are all placed into this state by the upper force. What has changed this year compared to last year? As Jews, do we feel safer? If we look at world events, unfortunately, the situation has changed for the worse. We are in the thick of a groundswell of hatred against Jews and Israel. Anti-Semitic incidents are at an all-time high in Europe and North America. In Britain, the Labour Party is rocked by anti-Semitic scandals and its leader, Jeremy Corbyn, is at the center of a crusade against Jews and Israel. The current climate is making British Jews consider leaving the country. In Germany, 1,000s of neo-Nazis are taking to the streets more often and more openly, mobilizing to rekindle Hitler’s thoughts and ideals. Their rallies recently became the most violent protests in decades, placing even civil authorities in jeopardy. France, Poland, Austria, Canada and the US also join the legion of countries where anti-Semitism is on the rise. In the US, anti-Semitic incidents are a widespread phenomena. Only last year, there was a 60% spike, the largest single-year increase on record, according to monitoring groups. And what about Israel? If Israel has been considered a safety net for the Jewish people, it is currently the source of a growing rift between the world’s two largest Jewish communities: Israeli and American Jews. Those in the Diaspora expect more pluralism from the Jewish state and self-determination in the way they conceive and live their Jewishness. There is also a significant split on how President Trump’s handling of the US-Israel relationship is viewed: 77% approval from Israelis, while only 34% of American Jews express positive views. As we approach the introspective period of Rosh Hashanah, there is growing urgency to understand where we are, how we’ve reached this place, and how we advance from here. The words, “Rosh Hashanah,” come from the Hebrew words, “Rosh Hashinui” — the beginning of change. Besides food and family gatherings, Jewish festivals have profound meanings. Rosh Hashanah is not just the beginning of the Hebrew calendar. It is a symbol of renewal, when we start examining ourselves and determining how we want to improve ourselves. We taste from a fish’s head to state that we want to be the head and not the tail, meaning that we want to determine our path and not blindly follow the herd. We eat pomegranate seeds, where each seed represents a desire we discover within, and which we want to learn to use not selfishly, but in order to benefit others. Also, we eat an apple, the symbol of the sin (of self-centeredness), and sweeten it with honey, which symbolizes learning to use even that primordial temptation altruistically. The people of Israel coined the saying, “Love your neighbor as yourself,” and to various degrees implemented it until the ruin of the second Temple. All of our festivals symbolize milestones along the path of transformation from the evil inclination — namely egoism — to altruism, where we love our neighbors as ourselves. It is written in the Mishnah and the Gemarah (and countless other texts) that the only reason why the second Temple was ruined is unfounded hatred. That is, when egoism takes over, we fall. We have been established as a nation only when we vowed to be “as one man with one heart.” When we broke that vow we were dispersed and exiled. No less important than our vow to be as one was the promise we received that we would be a light for the nations. But in the absence of the bond between us, what light do we emit? When we are united and project that unity, we become a light for the nations and cannot be referred to as “warmongers” because we spread unity. Today’s biggest problem is the global mistrust we see on all levels. One by one our illusions shatter. Who can we trust? I’ll spare you the dismal examples that answer this rhetoric question, but it is clear that we are growing increasingly alienated from each other — the opposite of the unity and brotherly love that are so vital for survival in a world where everyone depends on everyone else. The more we pursue the current trend, the greater the pressure that will be applied on the Jews. Deep down, the world remembers that the Jews once knew the secret to proper human connection. 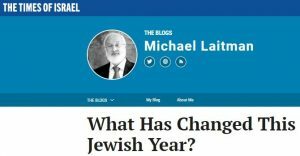 When that memory surfaces, it is vented out as accusations that we are warmongers, manipulators, and other “compliments” that have become part of the anti-Jewish lingo. Although we, too, are disconnected, but we are the ones who can and must rekindle our unity. We may still be very far from unity, but here at least is a recognition of the indispensability of this unjustly derogated value. So this Rosh Hashanah is an amazing opportunity to really make it Rosh Hashinui, and begin to change how we relate to one another. As we gather with family and friends, we must make it a point to rise above our differences and find the common goal of unity. And when we do that, the previously mentioned woes will be no more, since if you look at them, you’ll see that all of them derive from one and only origin — our overblown egos. This year, let’s spread some honey on our overblown egos, symbolized by the apple (Heb: tapuach, from the word, tafuach [bloated]), and sweeten them with unity. This is all we need; this is all the world needs; and it is the key to our lasting happiness. The difference between Klipa and holiness is not in action, but in intention. Holiness is all that is for the benefit of others, including the Creator, and all that is for one’s own good is a Klipa. It turns out that there is no difference between Klipa and holiness in actions, but only in intentions. If we pay attention to this, we will see that it is easy to move quickly from a Klipa to holiness, and vice versa, to fall from holiness into a Klipa. Therefore, one needs to pay attention only to the intention, and one can quickly correct one’s actions. The internal states the Creator throws us into do not matter. We just need to check the intention, and if necessary, immediately change it with the help of corrections within the group. This is the most reliable test. It takes many years for a person to form this picture, but when it is formed, he makes corrections relatively quickly and easily. Question from Facebook: What is perfection? Answer: Perfection is absolute harmony between the created beings and the Creator when they mutually complement each other in such a way that no imperfection is left between them. Perfection is the Creator. However, it is not Him by Himself; rather, it is how we define Him in our sensations. Question: What is a perfect person? Answer: A perfect person is one who is completely similar to the Creator. The Creator is the absolute perfection of nature. The general state of the entire universe that is in absolute connection in all its manifestations—that’s perfection. The source of this perfection that we attain is called the Creator. Question: Does it mean that there is no perfection in our world? Answer: Of course not! In our world, everything is opposite to perfection because one acts at the expense of the other. Our world is the lowest, the worst of the worlds. Only ascent above it is possible. There is nothing worse than this world.